A very happy Belfast Branch DAA Intermediate class: Congratulations to all who worked so hard and obtained their certificates. Anne Graham put her thoughts into poetry! Oh No! I’ve forgotten to do the thing twice. 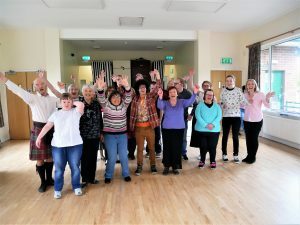 A group of dancers from the Belfast branch were delighted to be asked to provide a series of one hour workshops over a 4 week period for Orchardville Society Community Inclusion Group in Bangor. The Orchardville Society has supported over 250 people with a learning disability in the greater Belfast area in employment each year and is committed to be the leading provider of opportunities to equip people with a Learning Disability or Autism, to achieve their individual ambitions. Lucy Mulholland, a teacher from the Belfast branch, assisted by 3 dancers, engaged the novice dancers with a fun filled programme for all to enjoy. 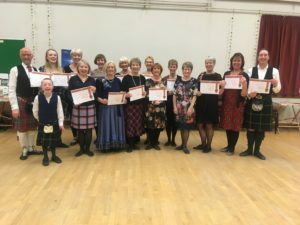 At the final workshop the group enjoyed demonstrating their recently learned dances to a small team from the Belfast branch who reciprocated with a short demonstration of both quick time and strathspey dances. It was a pleasure to meet all the people in the group and we hope to be invited back soon!